If you want your new vehicle to last as long as possible and run at peak performance on Woodway roads, it’s vital that you get regular oil changes. You may have heard it recommended that you get an oil change every 3,000 miles. However, thanks to advances in oil and engine technology, you can now wait quite a bit longer, saving time and money. Most experts now recommend that you get an oil change every 7,500 to 10,000 miles, but you should always check your owner’s manual to see what applies to your vehicle. Even drivers who don’t regularly use their car will want to get an oil change at least twice per year. Oil will break down over time, no matter how little you use your vehicle. Make sure your filter is being replaced as well when you get an oil change. If you’re performing an oil change yourself, you can contact the Allen Samuels Dodge Chrysler Jeep Ram FIAT parts department and ask to have an oil filter set aside for you to pick up. If you’re wondering whether you should use synthetic or conventional oil, consult your owner’s manual. You’ll find that synthetic oil can cost more, but some vehicles do require it. The good news is that synthetic oil changes can often go up to twice as long as traditional oil changes. When Should I Check My Oil Level? It would be smart to check your oil level once a month, as this will prevent any oil leaks from going unnoticed and escalating.You should also take note of any change to the oil’s color, as well as the appearance of metal particles. These may be a sign of a more serious issue to take care of. If you notice either of these issues, or have realized it’s time for your next oil change, you can easily schedule service online with our experienced technicians. 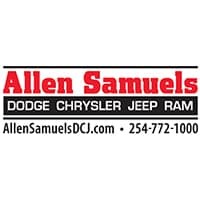 When you choose Allen Samuels Dodge Chrysler Jeep Ram FIAT in Waco for your routine maintenance, you’ll always get a fair price, as well as applicable service coupons to take advantage of. If you ever need additional service and maintenance advice on topics like tire number meaning, we’ve got you covered. We look forward to serving you! Inspect HVAC filter & test system for performance and temperature achievement. Freon, Leak checking and further diagnosis labor at not additional cost. Up to 5 quarts. Each additional $8.00 per. Coupon not valid with any other offer. Must present coupon at time of purchase. Limit one per person. Coupon does not apply to prior purchases. Other restrictions may apply. Void where prohibited.